Safety Peers - a community for the safety professional coming in the near future! Check out the first Safety Peers Article! I want to talk a little bit about a safety saying that we use in the industry all the time. As a matter of fact I hear it everywhere. I hear it at workplaces, I hear it outside of workplaces, I hear it at seminars as well as conferences. I see signs everywhere that contain the saying. As a matter of fact this saying has become so overused that I believe that it has lost any meaning. It has become a cliché. I even hear it used sarcastically at times. The saying is...wait for it... safety first. 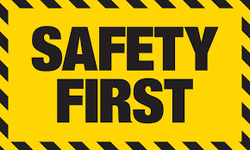 Now you may think it’s weird that a safety professional is kind of dissing a safety slogan that has been around forever, but unless something has real meaning, it does nothing to enhance the safety or the welfare of our coworkers. I have recently asked groups of employees during training sessions if they think safety first is a good idea. Knowing that I’m a safety guy, the response has been without a doubt YES IT IS. The tricky part is when I ask them to explain what safety first means. Some in the classes looked at me like I was an alien. I saw some chin rubbing and head scratching. Eventually some brave soul would blurt out “It means safety first," or "Don't ever do anything that could put you at risk of getting hurt." So let’s step back and try to understand what that answer means. I think it means that safety first is really an undefined feel good saying that is parroted to employees so many times that they have no clear meaning of the definition, so they just parrot it back. The Cambridge Dictionaries Online definition: Said to ​mean that it is ​best to ​avoid any ​unnecessary ​risks and to ​act so that you ​stay ​safe. Not bad, but when an actual dictionary definition begins with "Said to mean" I tend to be a bit skeptical that there is a proper and accepted definition. Take for example this same dictionary's definition of safety glasses: Special ​pieces of ​strong ​glass or ​plastic in a ​frame that ​fits​tightly to a person's ​face to ​protect ​their ​eyes from ​dangerous ​chemicals or ​machines. Nope, not one "said to mean" in that definition! Taken to its extreme, safety first could mean elimination of all risk. Safety above all else. Wouldn’t it be awesome if safety first could eliminate all risk! I would love it, I care about employees and their welfare, but as we all know, you cannot do anything without risk. Did you drive today? Driving is a huge risk. Better sell the car. Remember- safety first! I’ve found that I have totally quit using the term safety first because I believe it has completely lost its meaning. It’s been so overused that it has become such a cliché or platitude that I just choose not to use it anymore. I do believe you can reduce and even eliminate the risk of injury and illness in the workplace, but it’s going to come from well trained and well informed employees as well as supervisors and managers who are onboard with auditing and enforcing safety policies and procedures. Not some tired old safety slogan hung on a big sign in the work area. So if in a crazy world I were able to rewrite the definition for safety first at work so that I would start using it again, that definition would be something like- as I approach my job for the day, say I was a machine operator, or an office worker, or any other of a million types of jobs there are in the world, I would first stop and make sure my work area is safe. Is my truck ready for the day, is my machine guarding in place, is my computer workstation set up correctly. Another set of questions would be am I aware of chemical and other hazards present? Do I have appropriate personal protective equipment and is it in good working order. Have I been trained and are there procedures for safely doing my job. Once this assessment was finished I would have the ability to be a safe, productive, and quality oriented employee. Safety, productivity, and quality really are the three legs that support a company’s profits. It is my firm belief that you must keep focus on all three legs for the good of all. So my vote is that safety first is something that I think we, as safety professionals, should stop using as freely as we do. I mean it seems like everywhere you look you see safety first, and you hear safety first everywhere. And as I said, unless something has meaning, what use is it? If I ever chose to use safety first in the workplace again, I will define it clearly. If I were to use it, the definition I would use would go something like, Safety First: Before starting a job or task, survey it for anything that may cause you harm and mitigate the risks as you were trained. Did you notice there was no "Said to mean" in my definition.